One of our favorite dishes we had recently at China Chilcano was the Aeropuerto, a vegetable fried rice dish with noodles. It was so good with nicely balanced sweetness and soy-sauce saltiness. It was with that in mind that I came up with this recipe for Chicken Fried Farro, which substitutes the quick-cooking wheat grain farro for rice. Farro is often sold semi-pearled, meaning some of the bran has been removed, which makes it cook faster. Technically this means it isn't a "whole" grain, but if such a strict definition were applied to many foods, we'd see a whole lot of "whole grain" products disappear. After it's been boiled to a chewy (al dente) texture, you can substitute it for rice in this dish and it works great. China Chilcano's menu claims that the Aeropuerto has 20 vegetables in it. I limited mine to five (onion, celery, carrot, snow peas, scallions), but you could certainly add more or use different ones. Bell pepper, zucchini, cabbage, peas, green beans, broccoli, cauliflower and many others would be welcome. The brown sugar is optional. Fried rice doesn't have to be a sweet dish, but China Chilcano's is pretty sweet and I was aiming for a similar flavor with the sauce, made with soy sauce, red chili pepper flakes, garlic and ginger. 1. Bring 2 cups of water to boil. Add salt and farro, swirl to combine, then reduce heat to simmer. Cook the farro for about 18 minutes until cooked through but still chewy. Drain and set aside. 2. Heat 1 tbsp. vegetable oil in a large skillet over medium-high heat. Add onion, carrot, celery and snow peas. Stir-fry until tender but still crisp and not browned, about 5 minutes. Remove from pan. 3. Heat 2 tbsp. vegetable oil in the skillet over medium-high heat. Add the chicken. Let it sit for about a minute to brown, then stir. Add 1 tsp. sesame oil and stir to combine. stir-fry until cooked through, about 5 minutes. Remove from pan. 4. Reduce heat to medium. Add the remaining tbsp. of vegetable oil to the skillet, then add the garlic, ginger, white-part of the scallions and red chili pepper flakes. 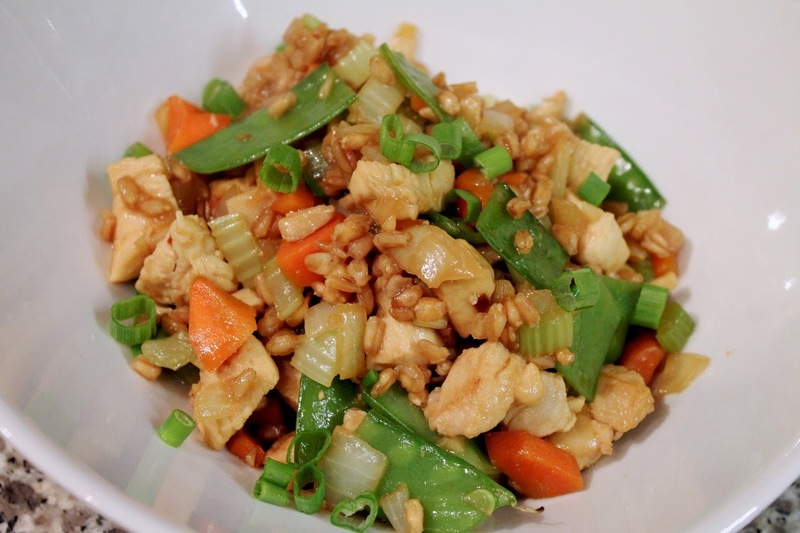 Stir-fry for about a minute, then add the cooked farro and the remaining 2 tsp. of sesame oil. Stir to combine, then add the cooked vegetables, cooked chicken, dark brown sugar and soy sauce. Stir to combine and reheat the cooked chicken and vegetables. Serve in shallow bowls topped with chopped scallion greens.